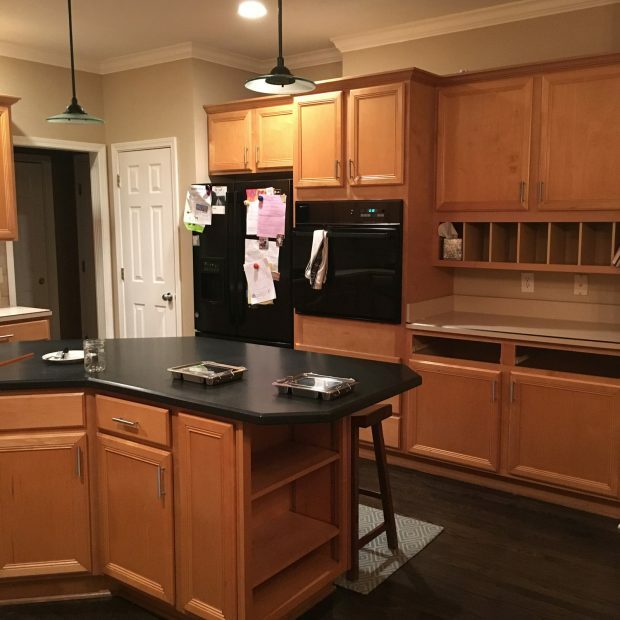 When we moved into our home nearly three years ago, I was thrilled that we had acquired a kitchen that was functional, but I would have no qualms about tearing apart. Finally, this summer, the time was right and we did it! I am in love with my new space and can’t wait to show you around! After doing some initial searches to determine the overall aesthetic I was going for, it was clear that I preferred a white and gray color scheme. 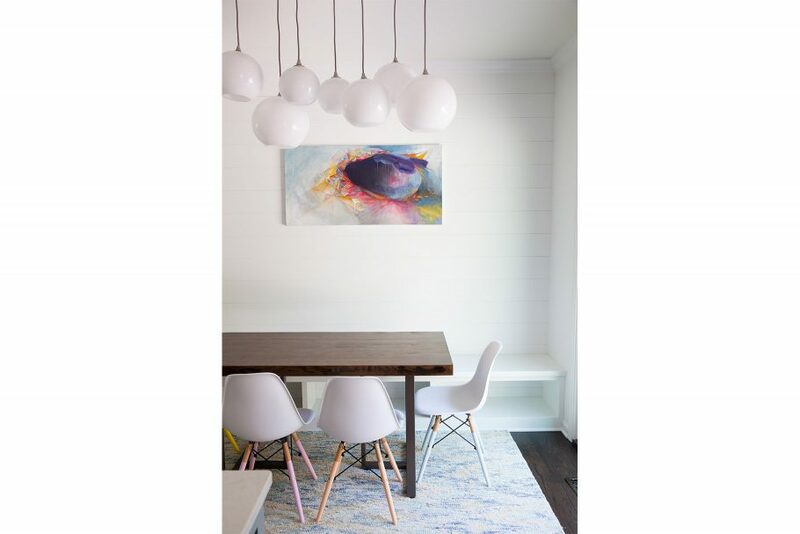 I love color though, so I was determined to incorporate pops of color throughout the decor. 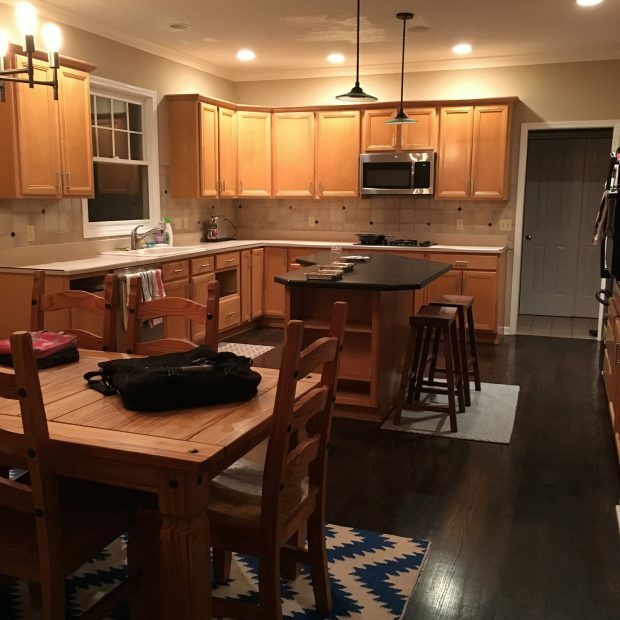 The overall layout of the room stayed pretty much the same, but the island was significantly enlarged and the oven was moved off of the wall and underneath the stove. 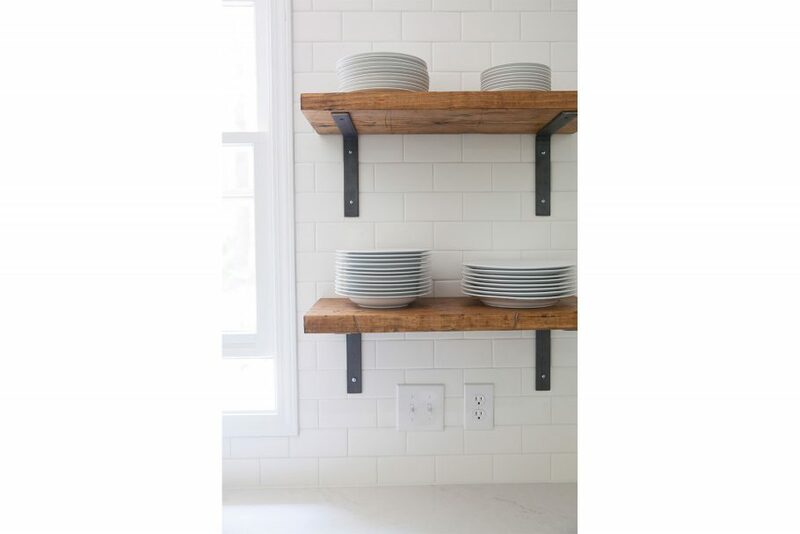 I am an avid cookbook collector and our old kitchen did not have a good place to store or display my cookbooks. 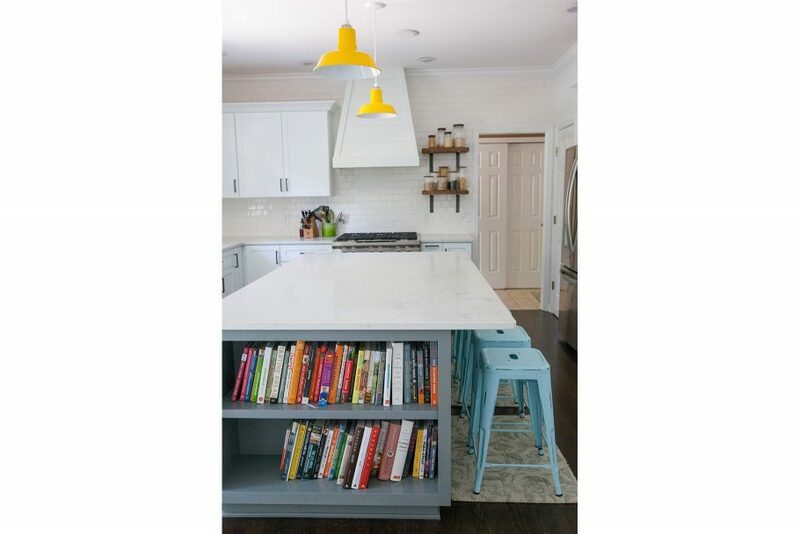 Since I use them so frequently and because they could double as a pop of color, we decided to kill two birds with one stone by adding shelves to the end of the island. I knew that above all else, the new kitchen needed much more light than the old one. We couldn’t change the layout of the windows however, because it would require structural changes outside that weren’t within our budget. Previously, aside from the hideous and dark finishes, the cabinetry was sucking so much light from the room. I opted for open shelving on either side of the window, and it is amazing what a different it makes in allowing light in (not to mention all those white surfaces bouncing light back at me!) 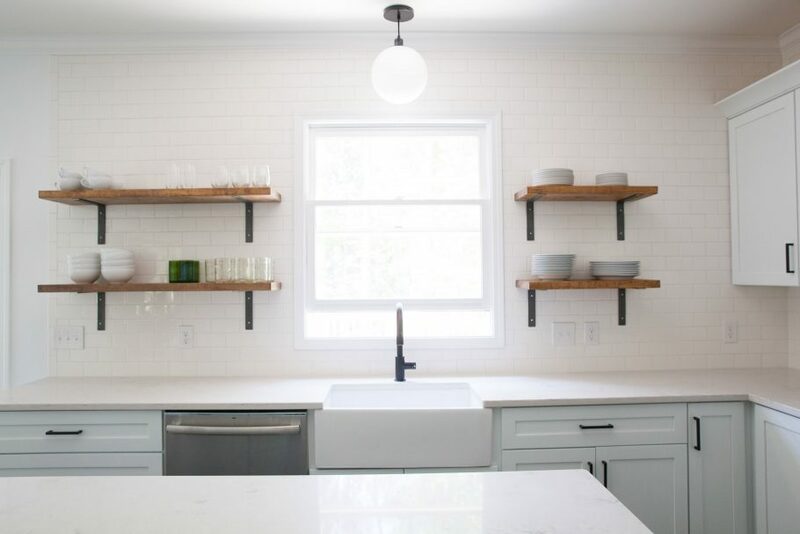 I also truly adore the farmhouse sink and the simple lines of the faucet. We decided to add some additional open shelving near the stove for visual interest, as well as an option for surplus cookbooks (a distinct possibility in my world.) 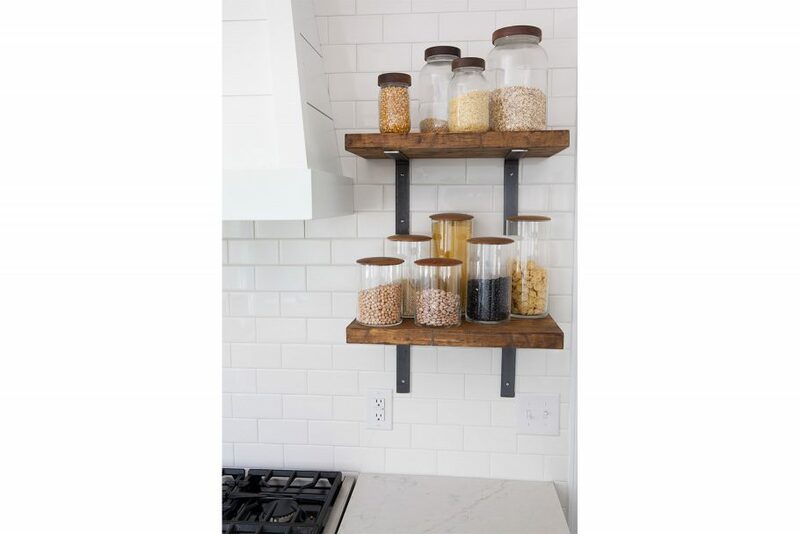 For now these shelves double as storage and decor, holding dry pantry staples like grains, pasta, and beans. An added bonus of this is that I always know when we are running low on these items! 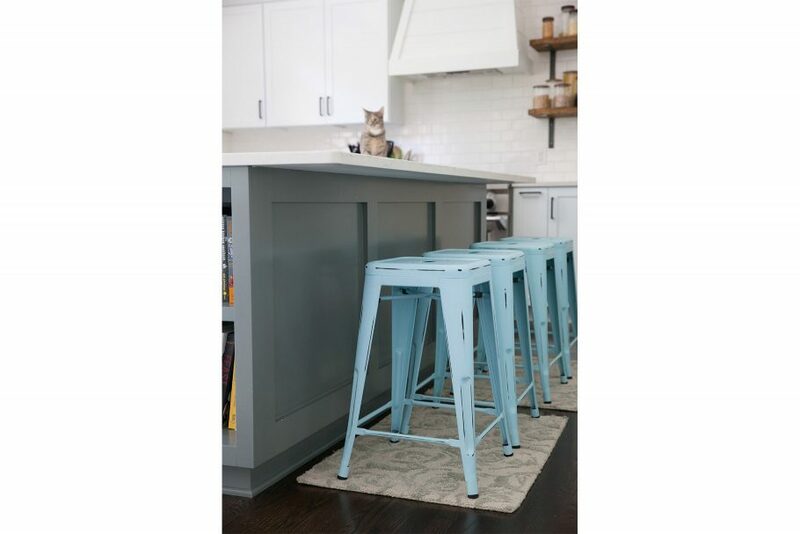 I played with the idea of four different colored bar stools but felt it would risk looking too chaotic so I kept them uniform. I love the brightness they add! 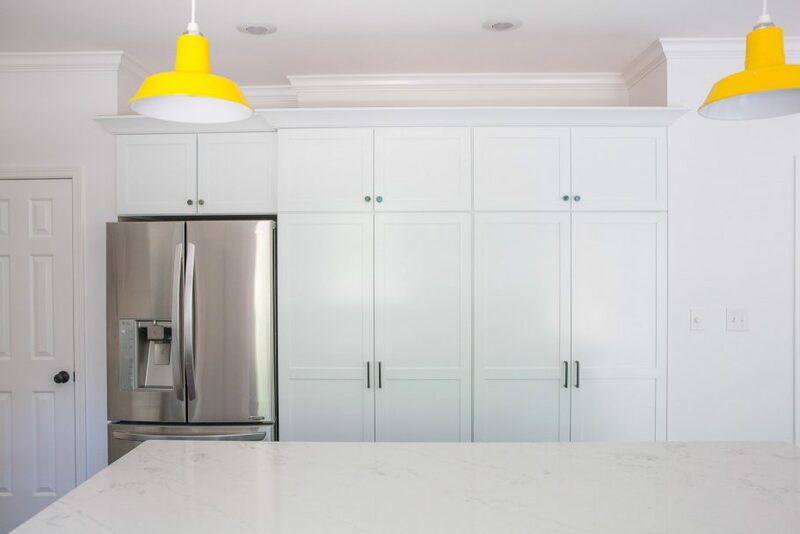 Oh hey, our builder did the custom cabinetry themselves! That is pretty freaking awesome if you ask me. Previously, this wall was an utter waste of space. It had a wall oven (yuck, and stupid because every time I opened it I had to tell the kids to stay put lest they hurt themselves) AND one of those stupid desks that are in kitchens but no one ever uses because you can’t pull a chair up to it and it basically just collects clutter and is worthless. Matt had the brilliant idea to use this to expand our pantry space (previously the tiny closet to the left of the fridge.) This was the best decision! So much space, so neat looking, and no place for clutter to collect. For years, the clutter of a spice cabinet with fourteen jars of coriander, a giant old container of Old Bay, and probably spices I had in my first apartment has driven me absolutely nuts. 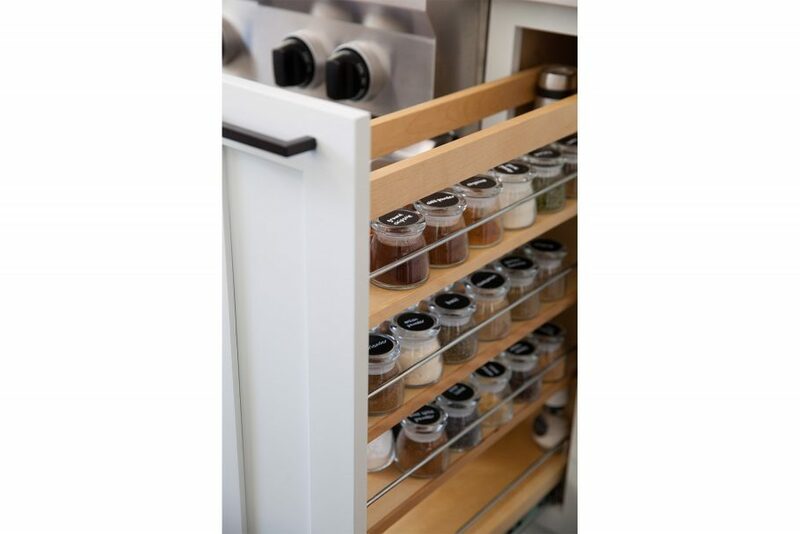 This slide out spice rack right next to the range has been organizational bliss! I will share a little more about the specifics of this project in an upcoming post. Friends, I can’t even tell you how thrilled I am with this range I chose. I hated everything about appliance shopping. Going to showrooms stressed me out, the price tags stressed me out, and I just couldn’t get a sense of what I needed. I researched and measured and agonized and researched some more, and eventually I ordered this range, sight unseen and hoped for the best. I LOVE IT. It is powerfully hot, has six glorious burners, and the oven has just enough extra width to allow plenty of wiggle room. I am really glad I didn’t go with something massive just because it was branded “professional” or so that I could tout a 10-burner range (seriously, I’m not a restaurant.) This is a charged up version of just what I need, but not over the top. As a side note, part of the hang up for me was initially trying to buy appliances of a single brand. We kept our existing dishwasher because it was in fine shape and I saw no need to replace it. I couldn’t find both a range and refrigerator I loved in a price range I approved of with good reviews, so I ended up just choosing different brands. I thought it would bother me but it doesn’t and I love my selections. 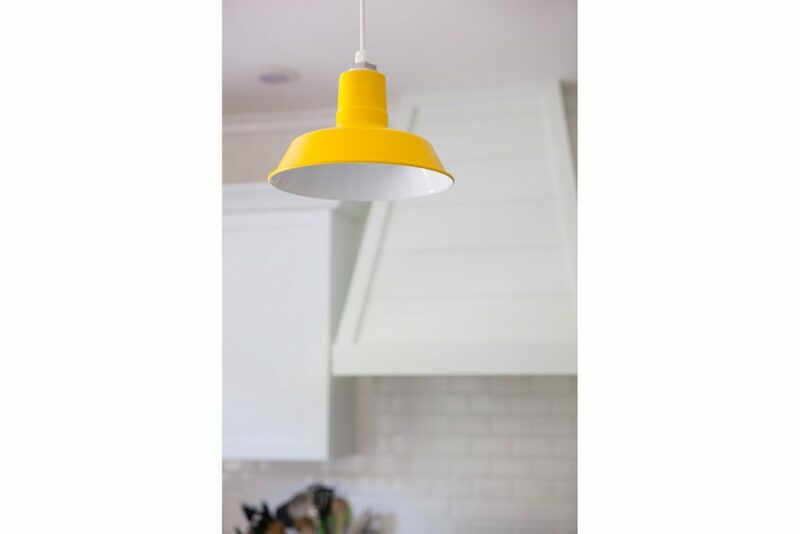 Yellow, true bright yellow, is my favorite color, and I knew without question it needed to be somewhere in my kitchen. 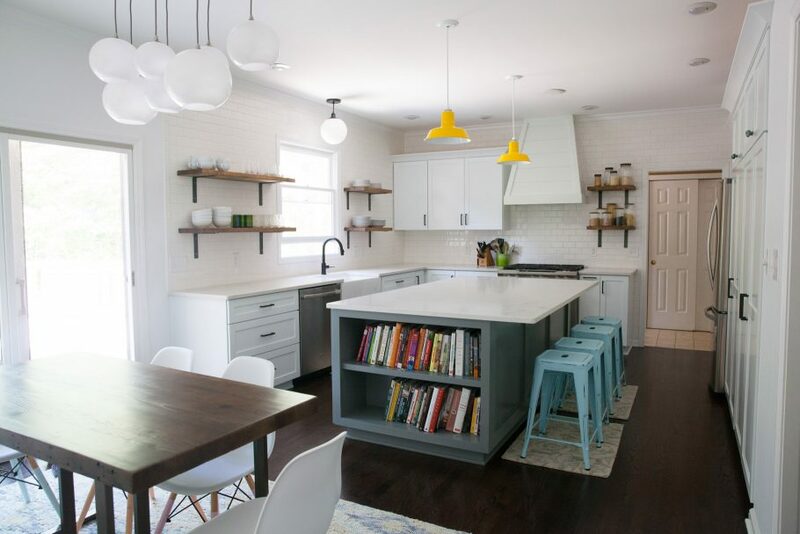 These pendant lights were the perfect way to incorporate yellow without it being just too much. Due to expanding the footprint of the island significantly, I was nervous about crowding the kitchen dining area. I thought that adding a bench on that wall would provide seating while saving space (as opposed to the room required to scoot back chairs). 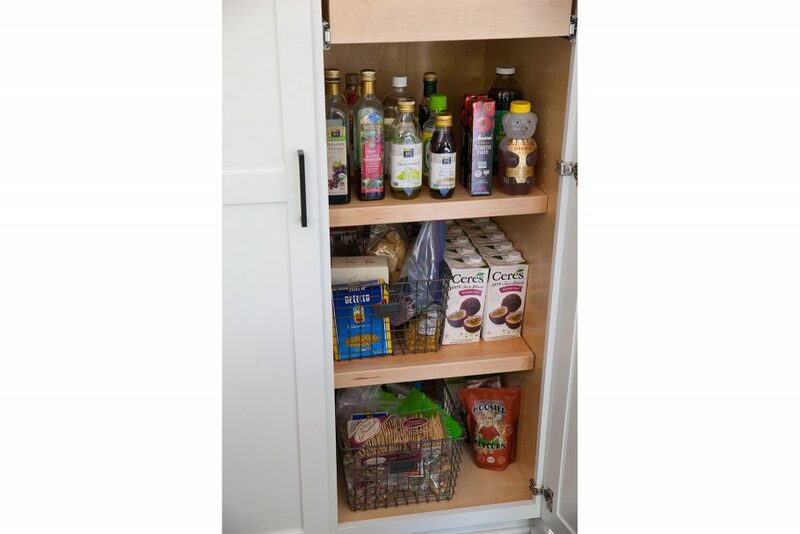 We chose to leave the bench hollow and open for additional storage if needed. I will probably buy or sew a cushion for the bench eventually, but haven’t gotten around to that yet. I knew I didn’t want a completely plain white wall in the dining area. 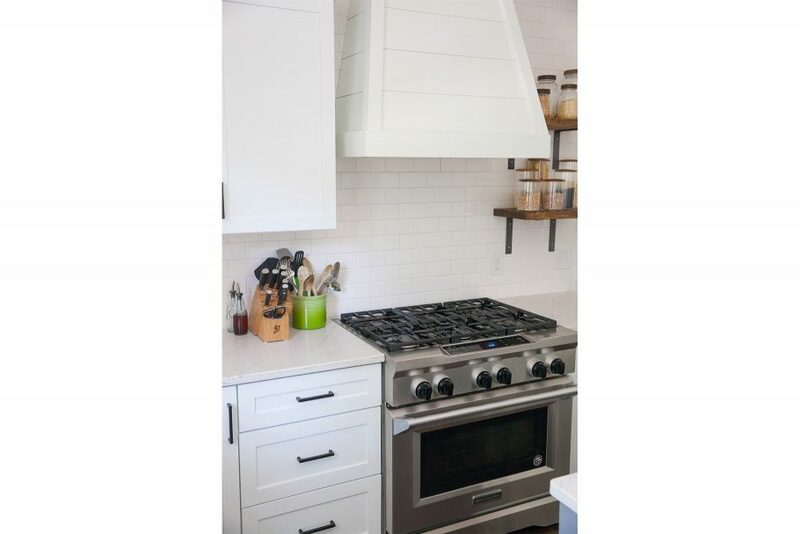 After tossing around many ideas for adding a bit of interest, we opted for shiplap on the wall to match the custom range hood. I love the way it turned out and I think it is an ideal background to display a favorite painting. Also, despite my extremely discerning opinions about nearly every light fixture that has ever been made, I was happy to find one that 1. I did not hate, and 2. I actually really LOVE. I would be remiss if I didn’t profusely thank our builder Emergent Construction for the amazing job that they did with this project. I don’t know about you, but I don’t hear most people raving about their contractors. Quite the opposite. However, I have nothing but great things to say about Matt, Alex, Dax, and everyone at Emergent that worked with us. Not only did they do a superb job with the renovation itself, they clearly take pride in their work and it shows in everything they do. From planning every detail, meeting deadlines, working within my budget, excellent communication along the way, and sending me pictures of my cats while I’m at work, they took care of everything. They were respectful of our time and space and understanding of how hard it is, especially for a family who loves to be in the kitchen, to be without a kitchen. In addition, Natalie of Natalie Troyer Design (and Matt’s wife) is the most kind and patient human on the earth. 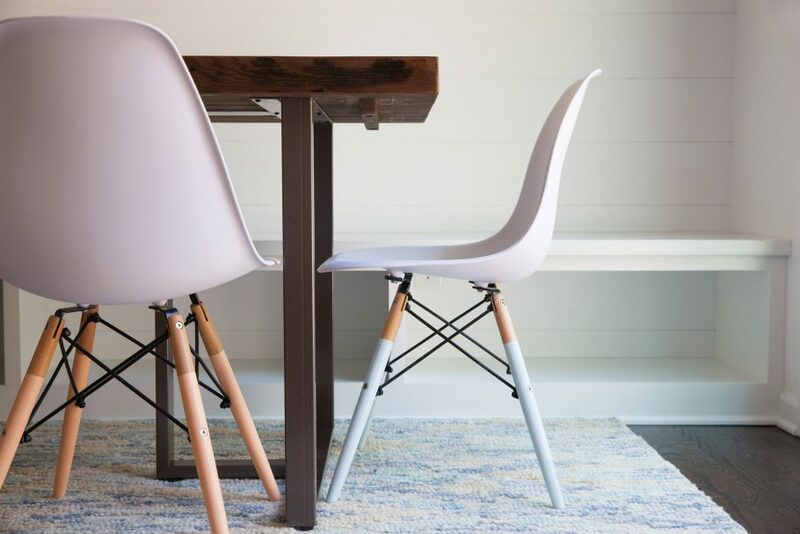 She was able to search high and low to find finishes I like at prices I can afford, understand my very vague reasons for disliking nearly every light fixture ever made, and helping to trouble shoot every little challenge that arose over the course of the remodel. These are wonderful people and I can’t imagine trusting anyone else with our future home renovation projects! Oh, were you wondering about the “Before” photos? Well all I have are these. Insert about 20 scream face emojis. Treat with a gin and tonic. I feel it is important to note that no portion of this renovation was sponsored. I had considered reaching out to companies to partner up but ultimately felt it was a disservice to my readers. 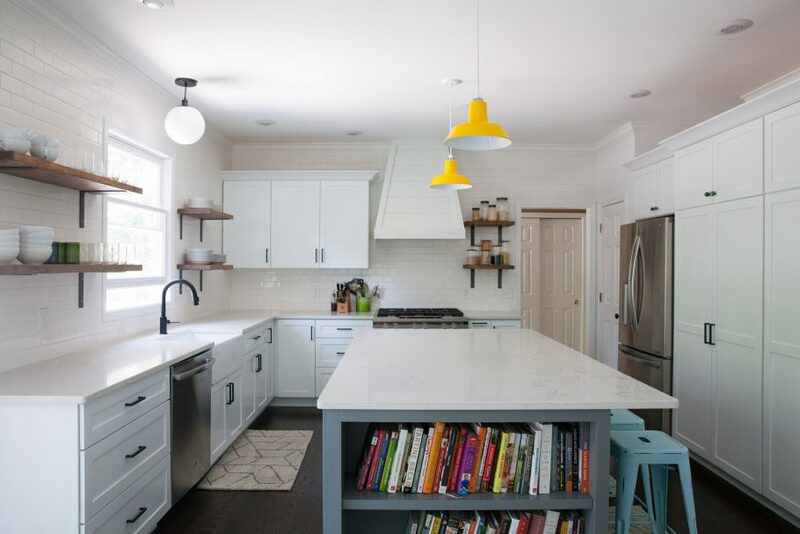 In the past I had even arranged partnerships for a large portion of the kitchen remodel, but ultimately felt like it was disingenuous and not something I felt comfortable with. This was our home renovation, and I didn’t want to turn it into an ad spot. So, I didn’t.